The embattled pro-Biafra group Indigenous Peoples of Biafra (IPOB),Thursday declared the administration of President Muhammadu Buhari a terrorist government. In a statement by the group’s Media and Publicity Secretary, Emma Powerful, described the Nigerian legal system, especially as configured by Buhari and his cacophony of family cabinet as a jungle. While decrying the continuing detention of her members across the country by the administration, the statement saw it as laughable situation where persons expressing their God-given human rights and political/administrative persuasions were simply dumped in prisons without any charges or trial in a regime that called itself a “democratic government. Or is it really demonic? “What we are saying is that the Buhari government should set free our members in various detention facilities across Nigeria if it is not ready to prosecute the court matters against them”. Describing Buhari’s administration was yet to convince the world in an open court of law which part of IPOB’s right to self determination as presently exercised was in breach of any known law of the land to qualify the group as a terrorist organization. Mr Powerful noted that the alleged missing case file of its leader, Nnamdi Kanu at the Appeal Court and the lackadaisical attitude of the federal government towards court matters in the country involving IPOB was enough indication that the government was unwilling to pursue the matters. He described the scenario as bizarre, unconscionable and ridiculous official misconduct never heard of or seen anywhere even in primitive ages. The statement read in part, “With ongoing moves by Nigerian Government to frustrate, through frivolous applications and adjournments, all pending cases involving IPOB in various courts within and outside Nigeria, we the Indigenous People of Biafra think that the time has come for this Buhari regime to release those held illegally in detention centres and prisons all across the country. “It is unheard of in the history of the world that a government is seen to be running from their own courts and afraid of legal processes they themselves instituted against a group they labeled a terrorist organisation. IPOB said the Buhari government had consistently failed to produce a single witness to testify on its behalf or corroborate its wild accusations against IPOB. Well done IPOB. I admire your courage and tenacity. 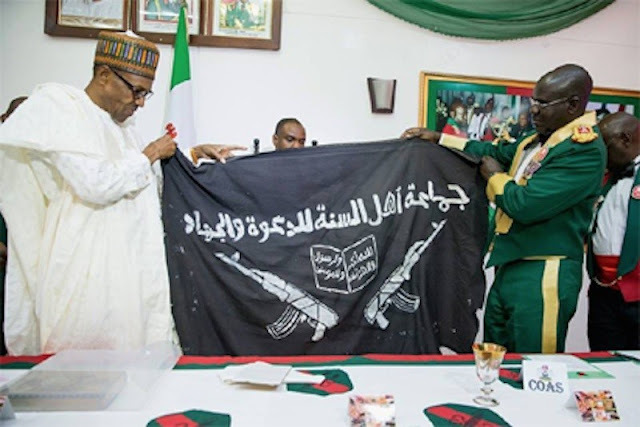 Buhari is not just a terrorist but founder and sponsor of Boko haram and Fulani herdsmen - #3 and #4 most deadly terrorist militant sects in the world. And this terrorist is the one presiding over the affairs of Nigeria. Shame on all those who call themselves Nigerians.